Once Upon a Hoofboot The meaning of endurance: bearing pain, or hardship, the ability or strength to continue despite fatigue, stress, or adverse conditions; stamina, a trial. If you are a distance rider you probably have experienced some or all of these descriptions of endurance, and so has your horse. What is interesting about the sport of endurance riding is that endurance means different things to different people. If you are over fifty and had a few bumps and bruises along the way, you really know what your own personal meaning of endurance is. My dream of riding distance began when I was in my mid-twenties. I had the horse, but was caught up with raising my children, a job, and also attending college classes part-time. The dream of distance riding gradually slipped farther away until it was just one of those things that I’d wished I’d done. Years passed, the kids were raised, grandchildren came, and I was confronted with an empty nest. We had twenty-five acres of land, and one day I started looking at horses on the internet with really no thought of having one, just looking. There was a two-month old filly for sale, she was Arabian crossed with spotted Saddlebred. I don’t know what made my fingers do it, but they did. I purchased her with mama alongside, sight unseen, to be delivered in two weeks. “Guess what honey, I bought a horse.” My very tolerant husband was not amused. We sort of did not have a fence, oh….and we didn’t exactly have a barn either. He built a nice lean to type shed in a week’s time, and put up enough electric fence to contain everyone. I’m a lucky woman to have a man like that. Delivered to my doorstep was an eighteen year old purebred arabian broodmare with her filly who was slated to become my endurance horse. The dream was once again ignited to ride distance. I am proud to say that I trained one of the meanest darn fillies that ever took breath on this planet. Just don’t ask me how much it hurt. 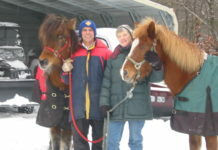 We started riding the barefoot miles, with many frustrations, unplanned dismounts, all with a rider who has bone spurs, osteoarthritis, fibromyalgia, and a balance disorder. My husband took some classes to learn how to do a natural trim on the horses. 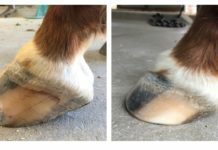 The more he studied on it, the more he wanted me to keep the horses hooves as natural as possible, and so we did. 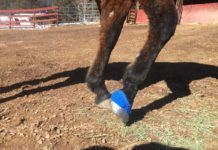 My horse trained barefoot, but when competing I would depend on my hoof boots for that rock that might have our name written on. I kept pushing on, trying to make my horse ready for her first Limited Distance ride as a five-year-old in the Spring of 2009. We entered the 2009 Chicken Chase at Henryville, Indiana. We got our completion but it was not without a price. About the only thing that went right that first ride was our hoof boots! She wore Epics on the fronts, and Gloves on the hinds. She started with them, and she finished sound with them. Back to the drawing board for me and my horse, a learning curve to determine where things went wrong, and the summer to rebuild my conditioning program and my horse to try again. We would enter the Spook Run in October 2009. It was pouring rain when we got there, and had been pouring rain for twenty-four hours. I had made the decision that the Spook Run was going to make or break us as a distance team. If Lil Bit of Magic could not complete the thirty mile limited distance ride sound and healthy, she was going to get a new job. Sounds like "sweet success" to me….Loved your story.